Stamper's Dream store is having a sale!!!! This Saturday and Sunday ALL Hero Arts stamps will be on sale for 20% off with the coupon code MYHERO. The coupon even takes 20% off the sale price, so that's a great deal! Here is one of my favorite cards I created with the Hero Arts set called Share Laughter. 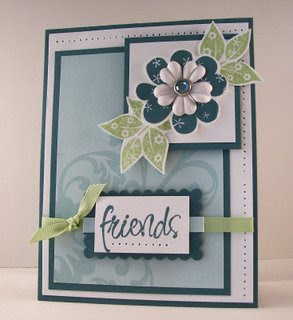 I chose this card to post with the announcement because it features one of the sets Michelle still has in stock---but they will go fast......so hurry on over to her store. You won't be sorry! Beautiful! Thanks for the info on the sale, going to go check it out! Thanks for the heads up Carolyn! Your card is beautiful! Very pretty Carolyn. Have to check out the sale! whohoo.. thanks for the heads up. Gorgeous Cammie! Love the color combo and thanks for the heads up on the sale! A beautiful card Cammie, I love Hero Arts stamps! The colors you've chosen are so soft and pretty, perfect for the image. I love your card! That blue flower is so pretty! Oh sooo gorgeous!! I love that layout....and the image dimension and depth is amazing! !